Best canyons for STAG Parties! Our team organizes programs for bachelor parties (STAG) in which you can choose activity packages or a single experience of canyoning. The packages include a canyoning, we call them the program ‘I’m macho forever’. These programs combine different activities as via ferrata, paragliding, paintball, quad excursions, parties on boats (…). Ask our packs programs and offers for one or two days. We can also help you choose the hotel-accommodation to suit you, offer transportation options and ultimately help you build an unforgettable weekend. 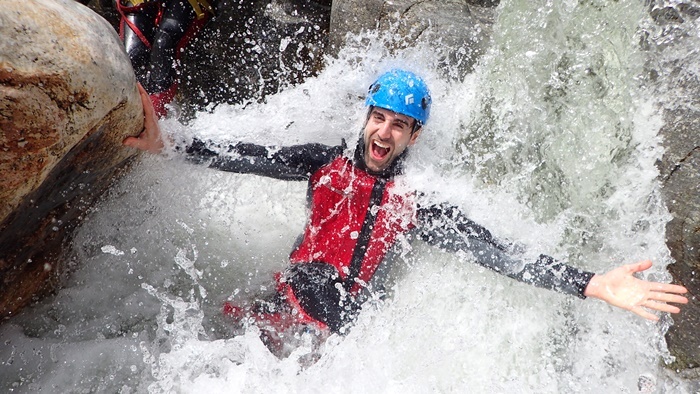 Our most requested canyoning trips for STAG are Guadalmina (near Marbella) and Rio Verde (Otivar-Granada). We are waiting for you for a memorable STAG Party! We have different Experience STAG packs, designed specially for STAG Events: Canyoning + E-Bikes, Canyoning + Via Ferrata, Canyoning + Paintball. Contact us for further information!